With their exams completed, the waiting game for results has begun for the teams; in a way, the awards ceremony tomorrow is the event that the whole Olympiad has been building up to. Among competitors and facilitators alike, there’s a certain tension that accompanies the anticipation of that event: it is perhaps alone in its capacity to affect the overall impact of the week. 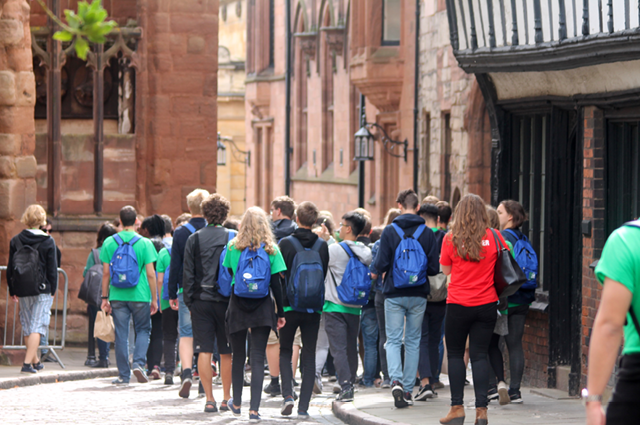 To keep the competitors’ minds off their predicament, we took the students off to visit Coventry, which featured visits to the Coventry Transport Museum and Coventry cathedral. Once arguably the UK’s most productive hub of industrial commerce, the West Midlands remain the heartland of the nation’s automotive sector. As such, the Transport Museum is appropriately located as a memorial of automotive products, and students were able to examine such unique exhibits as Thrust SSC, the first land vehicle to successfully break the sound barrier, and current world land speed record holder. The roof of the original Coventry cathedral was destroyed in the second world war, and remains standing today as a symbol of reconciliation; a modern multi-faith cathedral now adjoins it, designed around a similar theme, and the original bell tower remains standing as the highest parish bell tower in England. In the evening, students and staff were treated to an extraordinary performance from Simon Watt and his Ugly Animal Roadshow. A serious presentation of the social and environmental challenges faced by modern conservation was delivered through some wonderful and bizarre case studies. These included the effects of insulating “oven gloves” on wingless dung beetles, and a modelling clay-based talent competition emphasising the regenerative power of amphibians such as the Japanese giant salamander. Two among our number from the Republic of South Korea have had birthdays this week, and a small gathering surprised the pair today with birthday cake and its obligatory musical accompaniment: ping-pong, pick-up-sticks, and other simple games helped provide a real sense of fun to round off the day’s activities. Tomorrow the students have most of the day available to rest and recuperate from the long week so far. From there, many students will be looking forward to the awards dinner – we wish all of them well in the ceremony, which will formally mark the end of this year’s Olympiad.